About a year ago, the Danish Centre for Culture and Development (CKU) in cooperation with the Danish Embassy in Kathmandu, has announced new support to culture and development in Nepal, among others to street art, innovative robots and new TV programs. Here you can get an update of the program although not much info is offered on the results. “CKU has since 2007 worked strategically to stimulate creativity and entrepreneurship among Nepalese youth, in order to foster an environment for innovative products and services with an income-generating potential, CKU stated in a press release today”. CKU is a self-governing institution under the Danish Ministry of Foreign Affairs. In close cooperation with Danish embassies and representations, CKU manages culture and development programs in The Middle East, Asia, West Africa, and East Africa. In the article entitled “ELEVATING THE CREATIVE INDUSTRY IN MALAYSIA” the author explains how “unlike other types of businesses, creative industry entrepreneurs have nothing solid to show. They lament that it is almost impossible for them to obtain the funding they need in order to expand their operations. MyCreative Venture Chief Executive Officer Johan Ishak says that the creative industry in Malaysia “has generated an abundance of IPs which could be turned to valuable assets. […] MyCreative Venture’s mission then is to bring the Malaysian creative industry to the next level by achieving a sustainable future that is rewarding from the social, cultural and economic perspectives,” he said. For more info on MyCreative Venture, click here. The full article can be found here. More articles to come on Intellectual Property in cultural enterprises in the coming weeks. In the Touch Shanghai website of the Municipality of Shanghai, a visitor can find info and contact details of 10 selected developments for the Creative Industries. It is an impressive promotion and work in the different creative disciplines. Shanghai Pan-Tongji Design and Creation Cluster covers an area of 2.6 square kilometers around Tongji University. In 2009, the zone was denominated by the Ministry of Science and Technology of China as “Pan-Tongji R&D Design Service Industry Base” under the National Torch Program. 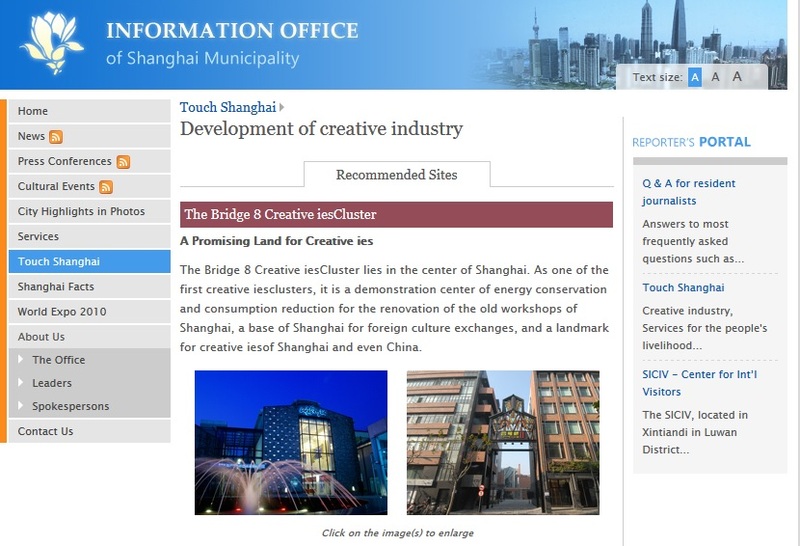 For more info, visit the Touch Shanghai-Development of creative industry websites here and here.